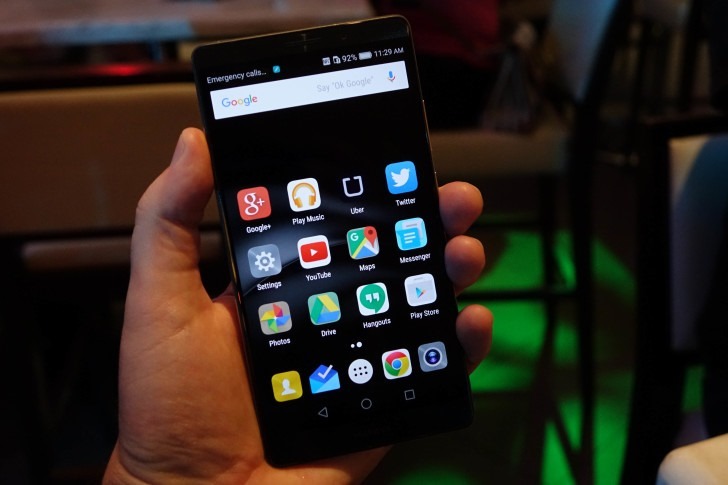 Huawei Mate 8 Prompt Tries To Scare Users Into Using EMUI Default Apps, Calls Third-Party Apps "Security Risks"
Let me be unambiguous: the Huawei Mate 8 is a good phone. I actually like a lot about it. But when I updated to the latest beta software (and yes, that deserves highlighting, obviously) this morning, I was greeted with a rather unpleasant new prompt in the default launcher settings area. Check this out. Turns out this message appears when you attempt to change any of the default apps away from the stock EMUI options. That includes the launcher, as above, the gallery, dialer, SMS app, camera, music, browser, and email. Once more, let me be completely clear when I say this message is basically horseshit. Huawei's claims have no supporting facts, they are unashamed blanket statements, and there is simply no good reason for a prompt like this to exist. I'm not even sure this would pass muster during Google's CTS (certification test suite) checks, which do have provisions explicitly relating to the ability to change the default launcher. While this doesn't stop you from changing launchers or another default app, it's clearly against the spirit of being able to freely do so, and would likely convince inexperienced or wary smartphone users to stick with the EMUI apps just to play it safe. Obviously, experienced smartphone jockeys like ourselves would gladly ignore this prompt, because we know it's bogus. But we're the minority. Huawei's motives here are unclear, and this is part of why we should keep the pitchforks down, but still make it known this is bad behavior. This prompt could well be the work of a lone software engineer who simply thought they were providing users what they deemed a responsible warning about the [realistically improbable, but theoretically possible] dangers of using a third-party launcher or other default app replacement. It may just totally go away by the time the retail software launches (the Mate 8 isn't out yet). That is the most generous explanation and outcome I can paint. On the other hand, it's also possible this message is more nefarious in nature. I want to emphasize that what I say here is complete conjecture - I have no evidence. 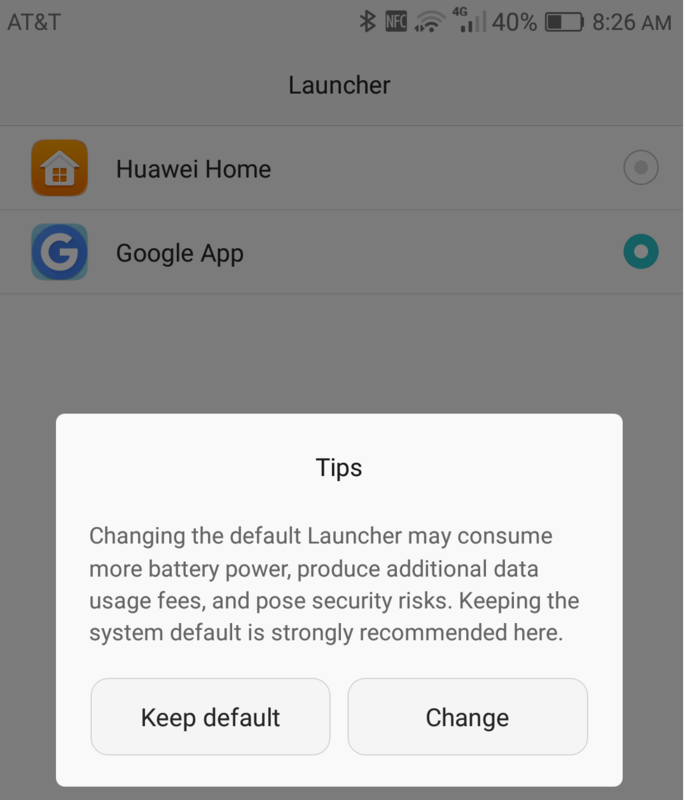 Why would Huawei be interested in scaring users into keeping the EMUI apps as the defaults? Well, I wouldn't be surprised if they collect at least some usage analytics. If users use a different launcher, for example, that theoretical usage data for the EMUI launcher goes away. But again, that's just spitballing, and probably the most incriminating interpretation you could have for this behavior. So, knowing what I do - that this prompt is annoying and spreads unwarranted FUD - Huawei should remove it. It is against the spirit of Android, it is wholly unnecessary, and it is bound to lead to misunderstandings among many users. There may well be evil, battery-sucking, data-hogging spyware launchers and camera apps circulating in China, I don't know. But what I do know is that the "install unknown sources" toggle makes it clear that any APK you sideload, be it a launcher or anything else, could potentially be dangerous. And I'm not saying the Play Store is a total content safe haven, either. But this prompt sends the wrong message, and I'd dread to see it start popping up on devices from other manufacturers. So cut it out, Huawei.